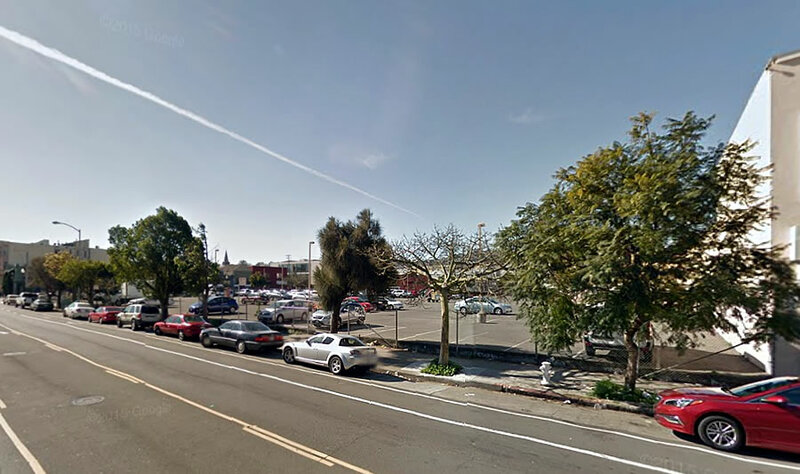 While currently only zoned for building up to 55-feet in height, the two players picked by the Mayor’s Office of Housing and Community Development to redevelop the Mission District parking lot at 2060 Folsom Street were planning to invoke the City’s proposed density bonus to build up to 101 units of affordable housing in a 75-foot-tall building on the site. But instead, the Chinatown Community Development Center and Mission Economic Development Agency are now planning to seek a formal rezoning of the site to allow the construction of a nine-story building, rising up to 85-feet in height, with 134 units of affordable housing, 10,000 square feet of space for supportive services, a 4,400 square foot child development center, a 600-square-foot cafe fronting Folsom, and a promenade to abut the future Folsom and 17th Street park on the southern half of the parking lot parcel. 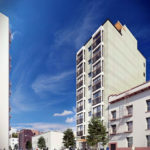 And while the proposed development will now require San Francisco’s Board of Supervisors to approve a legislative amendment for the rezoning, and for the City’s Planning Commission to then approve the plans, the 2060 Folsom Street project has just been granted an infill-based exemption from having to complete a lengthy Environmental Impact Report (EIR). Its a bit hard to tell, but the rendering does not look bad for an affordable housing project. Of course the shrubs out front won me over. The art on the building is nice as is the green wall and set backs at the ground floor. The lower floor “baffles” are an interesting touch. I hope this is close to what finally gets built here. Yay, I think this project looks like a good scale for that location. Great way to make use of the density bonus. As the project manager I can tell you that the density bonus was never the primary play, since the site has to be rezoned from P-Public to allow housing. I think the SocketSite writer from the Sept. article came up with the density bonus idea! Not sure there’s anything specific about the snapshot / rendering that points to it being DBA, but he definitely tends to turn out solid BMR work on the regular. I’m sure Peskin will find a way to kill the additional height and community groups will slow the process to a crawl if not kill it. Opening 2026! Will be interested in seeing the price for the Tax funded project. In the past, Market rate developments come in way less to build than nonprofits and city involved projects. And then those homeless will migrate over to join their 100 or so friends in the Potrero Flats. Actually they’re not “friends” – in the last 2 weeks I’ve seen physical altercations between vagrants on 3 separate occasions in the 7th-16th-Irwin triangle. At least one incident involved assault with what looked like bike parts. These are not your friendly cartoon hobos, folks. No matter what their so-called “advocates” would have you believe. No they aren’t friendly “cartoon hobos”. And they also aren’t all violent criminals like you would have us believe. The only way this is not happening is if Chinatown Community Development Center or Mission Economic Development Agency or PODER (weren’t they going to have office space in this building?) says something critical of the mayor. I very much doubt the actual bldg will look even remotely like the rendering. 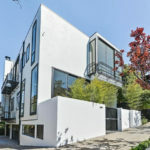 More likely akin to the stucco monstrosities sprinkled along Cezar Chaves east of Mission. Why would it look like public housing townhomes that were built nearly two decades ago? Seriously, think about it. Build it high! You definitely don’t want to be ground floor in this location. It floods every 5 years or so. So, no parking (private or ride-share) and no bike racks? Being at the intersection of the 12-Folsom (the bus to nowhere) and 22-Fillmore (slower than walking) is the game plan then? Good call! They really should have placed this project within four blocks of a major transit hub, like a BART station, if they aren’t going to provide parking. Err, isn’t the 16th and Mission Bart Station 3 or 4 blocks away? A lone BART station is not in any way a “major transit hub”. Calling it such exemplifies the non seriousness SFers have with transit. The nearest locale with even those pretensions would be at Market/Powell when the Central begins operation. Not much of a Grand Central, though. BTW, the Balboa BART station has about as many passengers as the 16th Station even though it is in a lower density area because it actually does serve as a transit “hub” for the surrounding neighborhoods. The 16th St BART station is a much used pissoir with a rather antiquated embedded subway. Not to worry, Jake. With the Mayor’s Office planning to build very low income and homeless housing and “supportive services” next to Balboa station, it will soon catch up to 16th Street. I have a sort of hypothetical question about homeless housing. Suppose we were to house every homeless person in San Francisco tomorrow. Just give them a private room, bath, three square meals a day, everything. What would happen? Would homelessness be cured overnight, or would more homeless move in to fill the void? Interesting question, Jimmy. I’d rephrase it. Assume a few thousand people a year become homeless each year and we build housing for them. Do they ever graduate out this housing or do they stay there until they die and we keep building a couple thousand units a year for the next several decades?